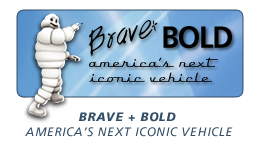 For 2009, Michelin Challenge Design asked entrants to explore what the next iconic American shape might be, with “Brave + Bold: America’s Next Iconic Vehicle.” The jury evaluated these for uniqueness in emotional appeal, design courage and technical execution. From 205 registrations, the jury selected 24 renderings for display at the 2010 North American International Auto Show, as well as 11 scale models. Celebrating American design, the full-size vehicles on displayed paired old with new, as Cadillac enabled the 2010 CTS coupe and the 1953 LeMans concept to be displayed; Ford volunteered 2010 and 1968 Mustangs; and Dodge provided a 1970 and 2010 Challenger.